It was November 1989, Wednesday, Nov. 22 to be exact. 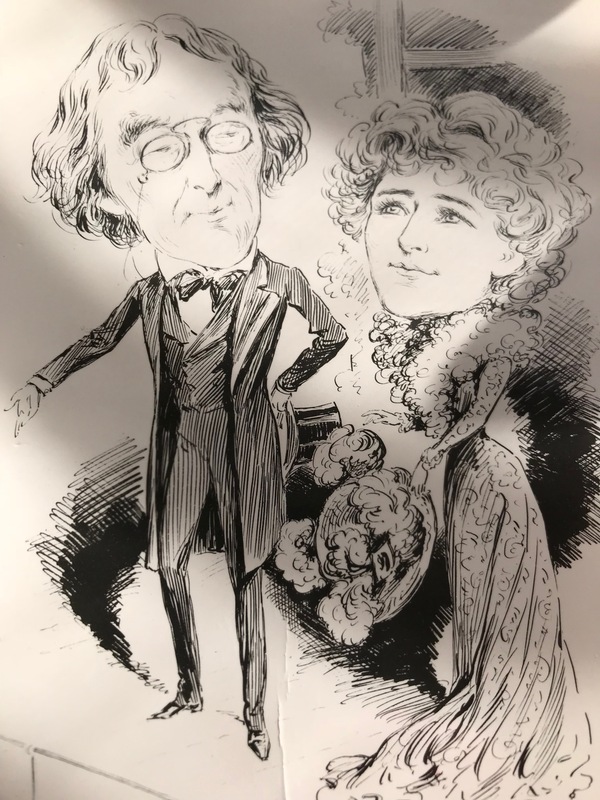 I was on a bus en route to Bath, England, researching my first spec screenplay, about the early life of Victorian actress Ellen Terry (illustration at right, with her later colleague Sir Henry Irving). The following is a direct transcription from my journal of the time, written at the end of that week, when I was preparing for the final leg of the journey back to London in time for my 30th birthday. [Thursday] Nightmarish – wonderful – magic. I had breakfast then ran up to meet Jane Tapley for the tour of Theatre Royal, Bath. After a 20-minute tour, I commenced to the Reference Library in Bath where a young man named Chris helped me find the Bath Chronicle for March 4, 1863 … I’VE GOT A COPY OF THE DRAMATIC MONOLOGUE! Hurrah! A thing I thought I couldn’t find! I was also able to get a playbill for the Opening Night of “Midsummer Night’s Dream.” I also chatted with a college student (blonde girl) who was doing her dissertation on Nazi art [?]. Directly after the library I took the 12:00 bus, at the bus station, to Bristol. What a dump Bristol has become! I wandered about the City Centre—the Tourist Bureau because I’d forgotten my map—then the Old Vic [Theatre Royal] where I bought souvenirs and arranged to take a tour on Friday. There was a performance of Ibsen’s “Master Builder” scheduled on Thursday at 3:00. I wandered up to the public library where I requested the Western Daily Press for Sept. 1862. I read the notices of “Endymion” on Sept. 15—then … came across the first of Godwin’s “Theatrical Jottings.” I wanted to have copies made, but the bound volume of papers was too big. I was able to jot down some notes. It was amazing to finally read [hear] Godwin’s own voice. I’m so far off base with him! He’s brilliant! After 4pm, I struggled wearily back to the bus station. On the bus back I had a drunk sit right behind me. I snapped at him and he wolfed back. I moved to the back of the bus. It was like an ominous note to a wonderful day—like the tumorous madman outside Tenterden—there’s a dark element to this whole proceeding. I went for a quick stout at the Smith Brothers, then had dinner at an Indian restaurant Tandoori [“Maharaja”] in Bath with chicken Madras, rice, and vegetables which made me sick later. It was odd. I stopped in for a last drink across the street, chatted with the Australian bartender and later, after I’d gotten back, was full of nausea and sickness—I threw up. A few glasses of water seemed to set me right and when I woke up in the morning I felt great. Bristol by 10 am. Portland Square. I photographed Godwin’s old home. Tour of Theatre Royal Bristol at 12 noon. A gorgeous, grey-eyed brunette with a beautiful accent showed a handful of us around. I showed her the script later, but she didn’t seem impressed. University of Bristol Theatre Dept. Talked with Mr. Christopher Robinson. George Rowell retired two years ago. Told him all about my project. 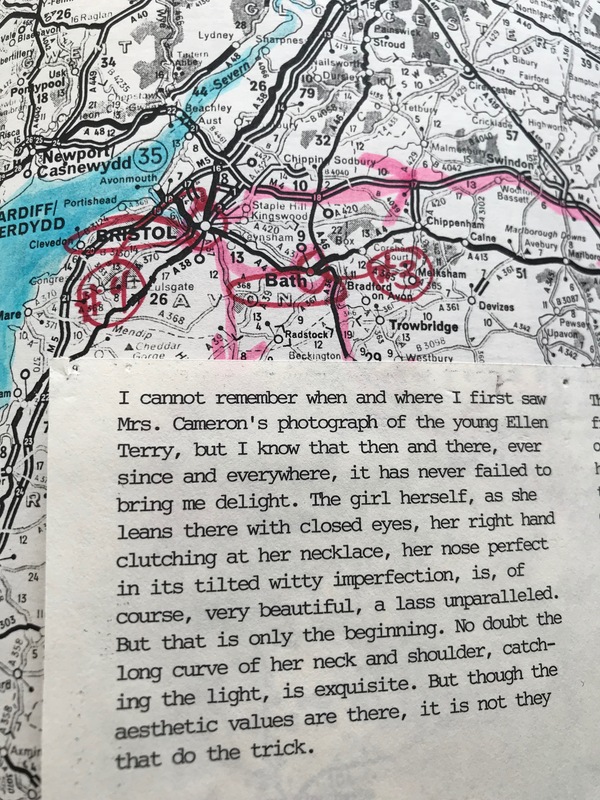 Photocopied Keith Barker’s article on Terrys and Godwin in Bristol. Back at B&B by 5 o’clock. I guess my big takeaway for this leg of the journey had to be the “ominious notes” that came from being on the road. Also, recalling the pure joy I felt in finding a missing piece in my research, right there in the Bath reference library. With the good and the bad, I took things in stride, knowing change was just around the corner, and with it fresh possibilities. Something, I believe, I still need to be reminded about. ~ by completelyinthedark on March 24, 2018.